WOW!!! What a post! CONGRATULATIONS on all your awards!!! Well deserved! "...living a Greek Godess life...?!" You're right! I absolutely LOVE that!!! LOL! Thanks! PS. I also love your 'red carpet' outfit!!! Kinda looks like mine! Hahaha! Thanks again, Vicki. I'm so sorry it took so long to post. Feel free to borrow the red carpet look any time.!! Welcome back. I missed reading you and this one was fun, I learned so much about you. LOVE your sense of humor, and especially love your outfit. Thank you for letting me know where to go so I, too, can be so classy! Holy longest post of my life. I seriously sat down and din't do anything else all morning. It feels like a weight off my shoulders. I still have to notify the people. You just wait. Project Runway will have an eye on that look. Fluffy robes are all the thing...I'm guessing :) Thanks for all of your support in getting going again. I was so happy to receive an award from you. You know how much I love your honesty and humor. I can't believe I found another person who likes gingersnaps AND olive juice. I need to visit you (and the beach) and then you need to visit me (and see the mountains). I'm on my way to check out those blogs. Have a wonderful day, and once again, Thank you! Thank you, thank you!!! I appreciate this so much! I loved reading all the facts about you. Oddly enough, I read The Time Traveler's Wife and just fell in love with it too! I thought it was wonderful... and An Affair to Remember is one of my favorites... You learn something new everyday! Well I hope I did this right! And thank you for including me!!! You look so cute and cozy!!! Love from the Mitten!!! Wow, that was one long post! Where do I start? First, congratulations on all the awards. It is nice to see your wonderful writing getting noticed. Second, thanks for sharing your facts and things you are grateful for. I learned a few things just when I thought I knew it all :) Finally, I hope that deserted island has internet access and electricity because otherwise that laptop will be a paperweight (without the paper). Why not your ducky robe or fluffy slippers instead? Congratulations on all these well-deserved awards. You rock! Have an amazing day. Thanks Ann. I'm always so glad to hear from you. I also saw that you Pinned my purple bag. I hope you liked it :) Much love..
and then... absolute THANKS to you for the Award. Wow: much appreciated!!! Sunday..we've got the Jags and you have the Bills. Good luck, man! You did not give me an award when I wasn't looking. I'm going to have to start sleeping with one eye open! This is so cool. I will get on this right away. Just when I was thinking that maybe blogging just wasn't my thing, you pull me in. You're always so good about things like that. Thanks girl. Very nice, Shan. Thank you for your sweet words. I can never quite describe this blog or why I keep up with it. Commenting back and forth with others has always made the experience worth it. Congrats again! wow! Thanks so much, friend!!! And, of course you look awesome in your 'ensemble'!!! ahahhaha!! Very well deserved! Great job!!! And you look adorable. Oh Alice. While I appreciate your wonderful sentiments (each one true), I am concerned. Aren't you busy writing a ten page paper right now? I mean, I know this blog is seven times more exciting than reading about...well, anything. Still. College is more important than my blog. Yeah, that's not true. I will definitely get to writing more about that incredible child of mine. Love you back! Congratulations Michele :-), well done on being awarded these awards but you deserve it you know. Thank you for surprising me and awarding me the sunshine blogger award and yes I accept it with gratitude and amazement.It probably take me a wee while to post about it but I will. I wanted to thank you as well for your kind words and prayers on my post I'm worn out, it really helped me. I thank God for you Michele and I pray for you. Smiles and hug to you. I am 5ft 5 too! AND my hubs makes me coffee every morning too.. AND he's amazed - well Okay, disgusted at my burping ability! AND my fave ice cream is Haagen dazs pralines and cream!! Spookey huh - it must be Halloween or something!!! You definitely done 'brung' it! Holy Moly you are a rockstar! Well deserved. I lOVE popcorn. YUMMY! Thanks, girl. Popcorn is often my lunch. I'm not kidding. I never get tired of it. I'm so glad you stopped by to read the chapters of the long posts. 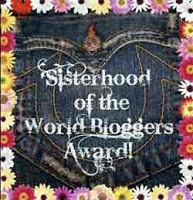 Hope you'll accept your sisterhood award! Enjoy your day! Thanks so much, Kreeme. My apologies for taking so long to accept the awards. I'm very happy to get them. Let me know if you post about yours! It's been wonderful getting to know so many lovely people. Congrats on your many awards and thank you for the Sunshine Blog Award/nomination. I will be writing my acceptance post soon. I also want to thank you for sharing so many interesting facts about yourself. I'm not sure mine will be as exciting, but oh well :0 keep an eye out anyway!